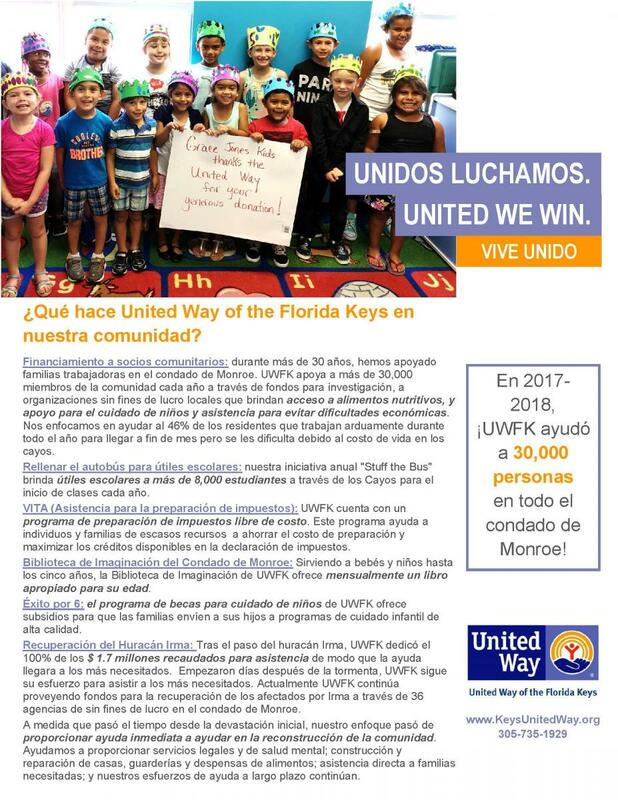 Click on the images below to learn more about the work of UWFK and our nonprofit community partners, and our impact in our community. Click for Who do We Help? and What Does UWFK Do? fliers in Spanish. Over 90% of children served in the backpack program at Inez Martin come from single parent families. The other 10% may not be eligible for food stamps but are still in need of additional assistance to ensure they have the proper nutrition. With help from UWFK, this year at Inez Martin every single child who needed nutritional assistance was able to receive it! The MARC House has a client whose family lives below the poverty line. He is very grateful for both the nutritional lunch MARC serves but also the skills he is learning in the Rainbow Café. He is now seeking employment a dishwasher in the community to help with family expenses and bring them above the poverty line. MARC provides him with whatever leftovers they can spare from the FIT program funded by UWFK to take home so his mother, father and younger brother can have the food for dinner. 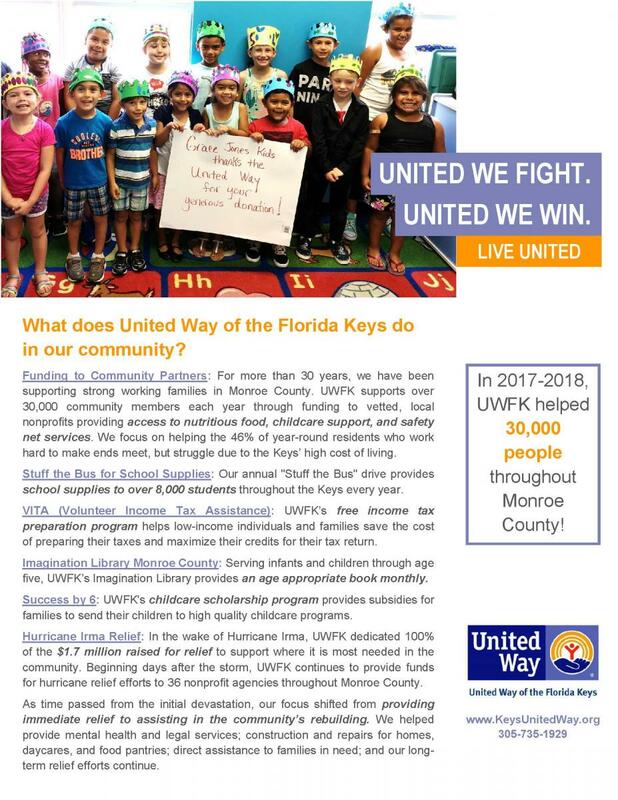 This shows how UWFK funded programs can go far beyond the numbers reported in the end of the year reports! Ken is a 54-year-old man living off SSI of $733 a month due to a serious heart condition, which keeps him from working. After paying his occupancy fee at FKOC, he has little money left over for his basic needs. 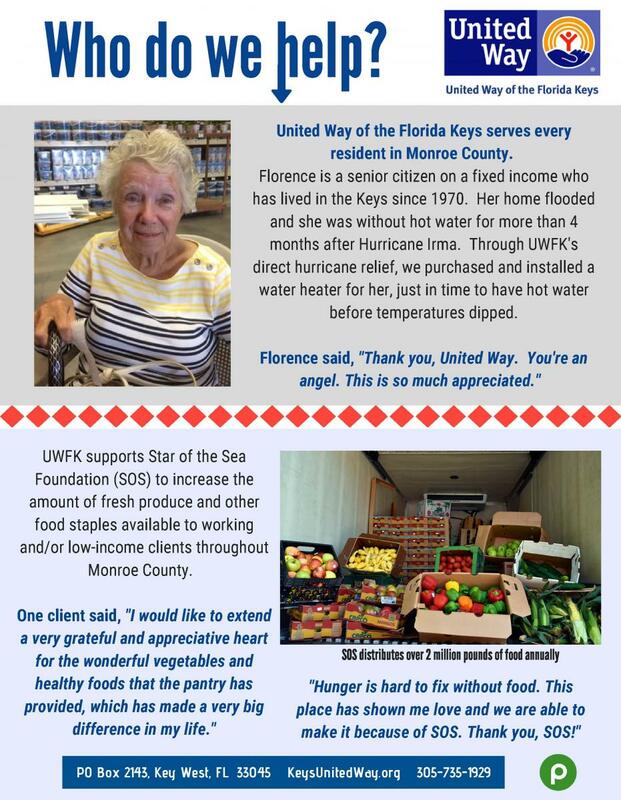 UWFK funding at the Loaves and Fishes food pantry has enabled Ken to receive desperately needed meals to sustain him throughout the month. Burton Memorial Church recently obtained a new client at the food pantry program. He was visibly embarrassed about needing the assistance and told church volunteers that he had recently lost one of his jobs (he was working two to make ends meet) and simply couldn’t pay all of his bills and still put food on the table for his wife and three children. 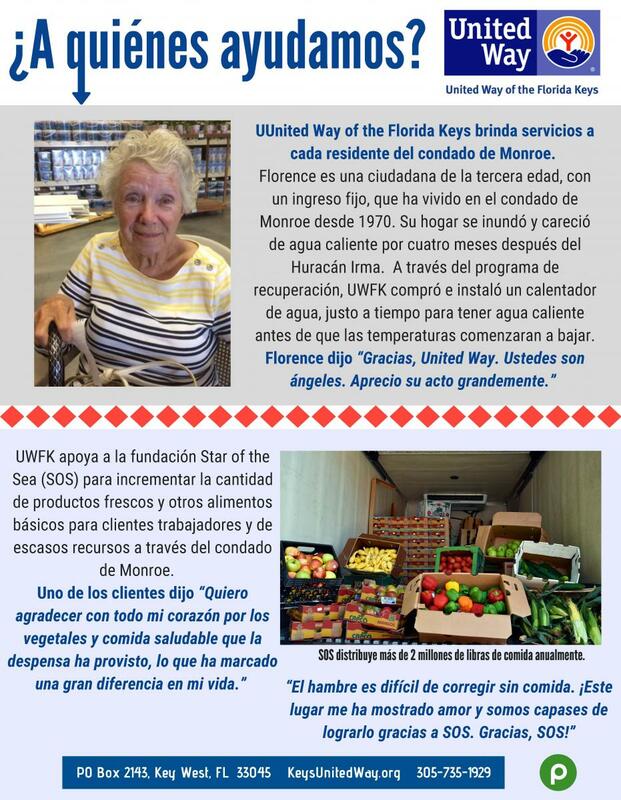 After receiving a UWFK funded bag of groceries, the man asked if he could volunteer at the pantry so he could “earn” his food. Church members told him that was not necessary, that many of us need help sometimes, and the purpose of the program was to get people like him through those hard times. At Burton Memorial CDC, UWFK funds provided scholarships for a family of three children who are being raised by their grandparents. The grandparents routinely struggle to make ends meet and would be unable to place their grandchildren in safe, quality afterschool programming without UWFK funding. 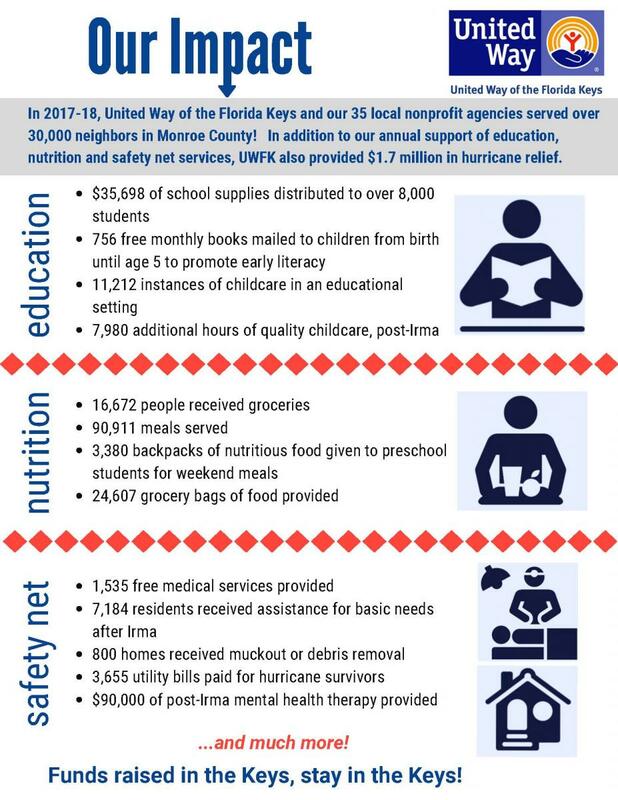 UWFK scholarship funding helps many families like these, including a single woman who is fostering her nephew, and a single working mother who can’t afford childcare due to the high cost of housing in Key Largo.